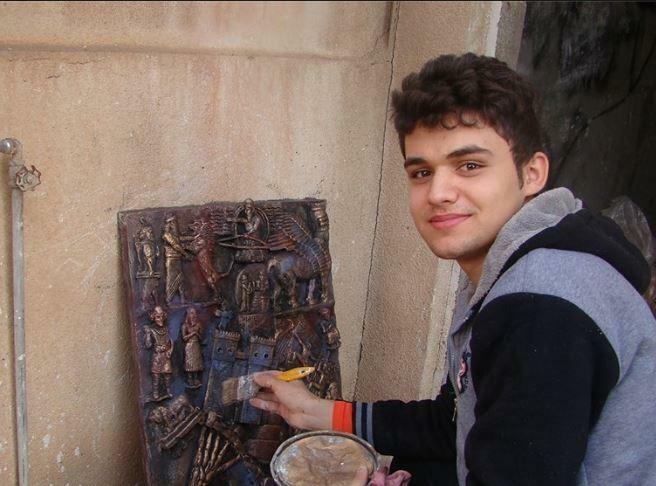 Continuing our theme of hope in the face of strife from last week with another dose of perspective, today's Artist Spotlight is going to look at the work of a young Assyrian sculptor named Nenous Thabit who has a powerful dose of hope for everyone affected by the destruction wrought by the Islamic State. Most of the Islamic State's terrorist campaigns are launched at the local people, and one of their most potent weapons is the destruction of local temples and historic sites for being 'un-Islamic'. This breaks the link the local people have with their cultural heritage and, in theory, makes them more likely to embrace the twisted vision of Islam espoused by the terrorists. His project will be a long one, but it's truly inspirational - he hopes to recreate many of the most famous works that have been destroyed by the Islamic State. At only 17 years of age, he has been practicing sculpting in his father's workshop, who is a professional sculptor. Thabit was inspired to action by the destruction of the ancient Assyrian temple of Nimrud, which IS fighters bragged about destroying with sledge hammers and bulldozers for not being Islamic. “They waged a war on art and culture, so I decided to fight them with art. Lamassu is my favourite statue, it is the strongest creature in the Assyrian heritage. “In Iraq, there are people who are killed because they are sculptors, because they are artists. Continuing to sculpt is a message that we will not be intimidated by those devils. So far, he has completed 18 new statues, including one of Lamassu, and is looking forwards to attending art school in the city of Dohuk in the coming year. Hopefully, he'll be able to maintain his optimism in the face of anger, and recreate many more of the lost treasures that so many artists, historians and curators have been racing to preserve.